In case you missed the memo, wallpaper is making a comeback, resurging from a place where it had been banished for being too flowery, too hard to take down, and grossly overused alongside pouffy couches and other '80s decor. With an emphasis on modern designs and sophisticated patterns, however, a new era of decorating with wallpaper is underway. But skeptics still abound. And if you've read this far, you're probably one of them. Fear not. Buying and hanging wallpaper is neither a life-long commitment nor a DIY fail waiting to happen. Not if you follow the expert advice we rounded up here, anyway. Sites like AllModern and Burke Decor could be a gold mine of decent papers, if you have a few hours to browse the wide range of options they offer. But if it's a to-the-trade-only paper you spotted on the pages of a magazine, getting your hands on it may not be as easy. Just about all of the designers we asked recommended checking online first. "There are many great smaller start-ups that you can find online," says designer Brendan Kwinter-Schwartz. "They will send samples by mail, [and] they are usually the most current, cutting-edge wallpaper companies." Alternatively, design centers offer programs like the New York Design Center's Access to Design that allow you to work with a professional designer in any capacity -- "to hire for full-scale [projects] or even to work as a purchasing agent," designer Brett Beldock explains. 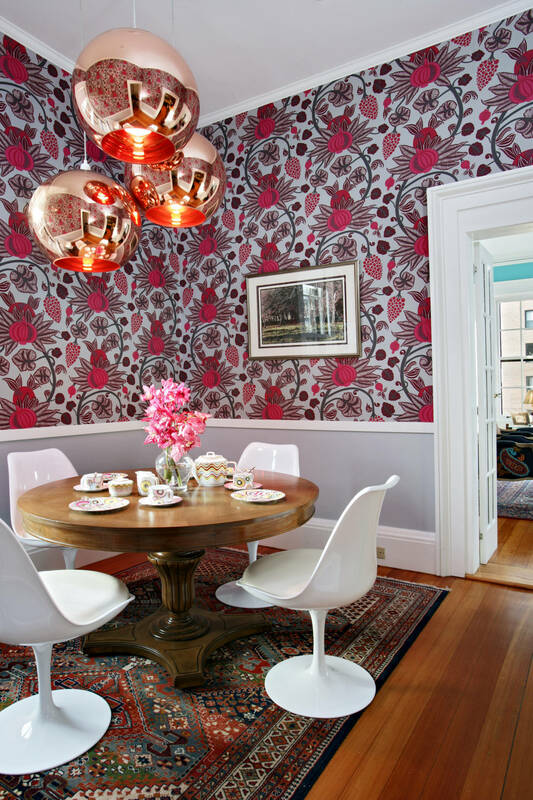 If busy patterns are what's driving your skepticism about wallpaper, consider easing into it. "Start with something easy, like a textured paper," designers Lydia Marks and Lisa Frantz suggest. 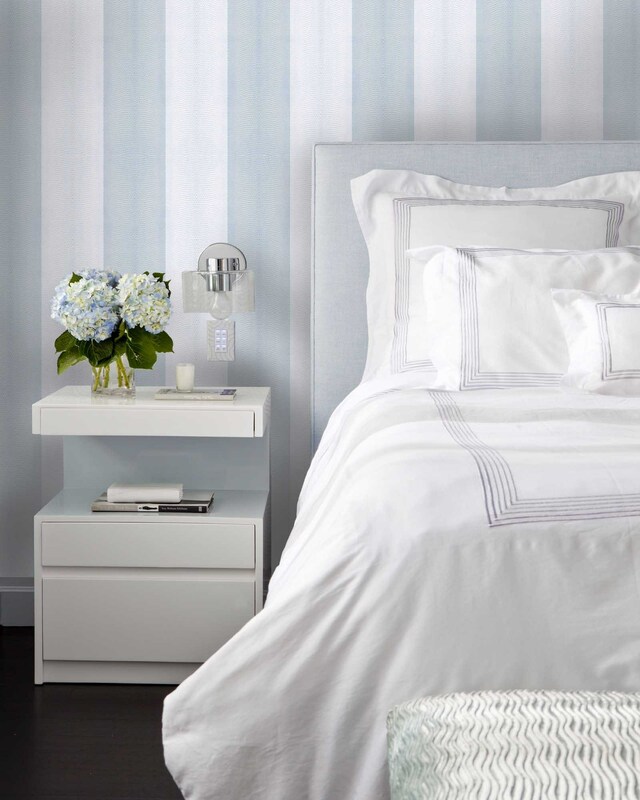 "A grasscloth is a great example of a neutral that can still pack a big punch without a big splashy pattern. Also try an accent wall or just below-the-chair rail as a way to ease into it." Designer Kati Curtis recommends getting six to eight samples, taping them together and visualizing them in the space. One other rule of thumb: "Stay away from gloss or metallic papers if you have a wall with imperfections. The shine will exacerbate the problem," says designer Eddie Lee. "Textures and thicker vinyls work best on imperfect walls -- they help hide what’s wrong." Note the width of the paper (generally 20.5” for English papers; 27” for most US papers; 36” for most grasscloths and textures; and 54” for vinyls and paper-backed fabrics). Then, take a measuring tape and mark off how many widths you need to cover the room. Next, measure the wall height from top of baseboard to bottom of crown (in yards if that is how the paper is measured), and don’t forget to add for soffits. Take the number of widths and multiply by the height in yards and you have the yards needed. Lastly, divide by how the paper is sold (3 yards to a roll, 11 yards to a roll, etc.) to see how many rolls you need. Refinishing an old dresser or freshening up a closet door is one thing, but when it comes to actually wallpapering a wall, designers agree: don't do it. "I would recommend hiring a pro if you are using traditional wallpapers that need edges trimmed, special adhesives or have tricky patterns to match," says Marks and Frantz. The exception, however, are the new wallpaper "tile" options designers like Curtis have used from companies such as Hyggee & West. A bonafide wallpaper hanger should know this, but just in case, Marks and Frantz recommend applying an alkyd or acrylic primer to the wall surface and allowing it to dry for 24 hours before applying wallpaper. "This allows for better adhesion and future strippability," they say. And, always use a blank stock liner paper. According to the design duo, "This is a white paper that goes on before the actual wallpaper. It prevents any wall imperfections from poking through, helps prevent shrinkage and basically give the actual wallpaper a nice absorbent surface to adhere to." If you're still mired in wallpaper fears, these 11 other tips for decorating your walls should help. Or, take a step back from the information overload and check out this gallery of favorite papers instead.